Set in Manhattan–the conniption capital of the world–a riotously funny and fresh debut novel about anger, infidelity, and friendship. Through a hilarious series of events, two strangers find themselves railroaded into an anger management class where they soon become fast friends. Iris is there because of an eminently justifiable meltdown on a crowded flight, whereas Ken got caught defacing library books with rude (but true!) messages about his former boyfriend. The boyfriend he caught in bed with another man on the same night he got fired from his night job proofreading in a law firm over the cardinal offense of talking back to a partner. Quelle horreur. Needless to say, Iris and Ken were cosmically destined to be friends. What follows is a strikingly original comedy of (occasionally bad) manners as Ken enlists Iris to infiltrate his ex-boyfriend’s life in the hope of discovering that he’s miserable. And Iris reciprocates, dispatching Ken to work himself into the confidence of her boyfriend who, she suspects, is starting to stray. But what if Ken’s ex isn’t crying himself to sleep? What if he’s not the amoral fiend Ken wants to believe he is? And what should Iris do when her worst suspicions start to come true? Exactly how perfect do we have the right to expect our fellow human beings to be? 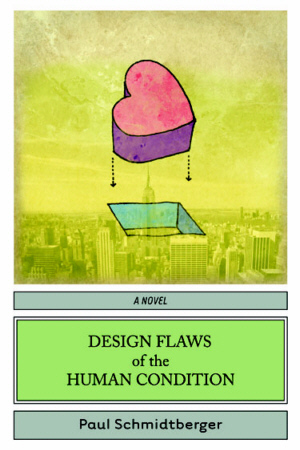 Anger, betrayal, loyalty, and friendship–Design Flaws of the Human Condition explores universal themes with wisdom, compassion, and a wickedly irreverent sense of humor. Readers will fall in love with Ken and Iris, and cheer them on as they attempt to right the wrongs of the universe. And what better team to root for, because if there’s one force strong enough to take on the universe itself, it’s the powerful bond of friendship between gay men and straight women.